The underlying issue was the fact that whales in some parts of the Pacific, occasionally get entangled in crab gear. Nearly all the entanglements have occurred hundreds of miles south of Humboldt County, but the broad hand of the state does not appear to be sensitive to geography. In 2017, the Center for Biological Diversity, a group based in Tucson, Arizona, filed a lawsuit against the Department of Fish and Wildlife, which supervises the statewide commercial Dungeness crab fishery, for failing to take adequate steps to protect humpback whales, blue whales and Pacific leatherback sea turtles. The issue went through the courts for a couple of years and the parties finally reached a settlement agreement March 26 in the US. District Court for the Northern District of California. Under the terms of the agreement, the state must apply for a "take permit" from the federal government. 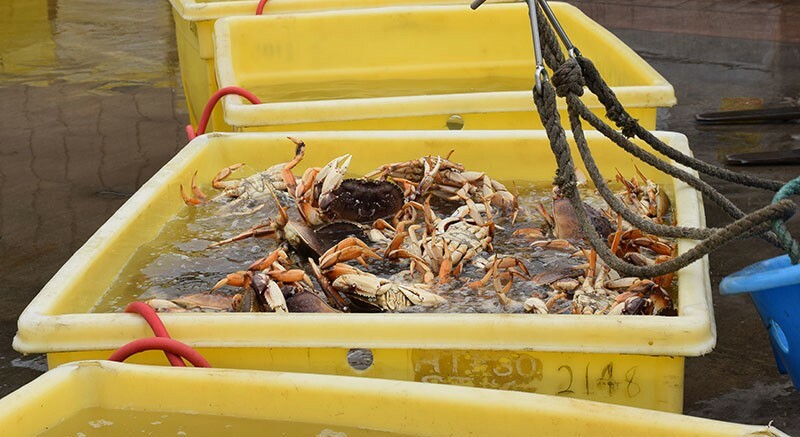 Until that occurs, Fish and Wildlife determined that the 2019 Dungeness crab season would end April 15, only a few weeks after crabbers had set their pots in the ocean. Local fishermen were given only two-weeks’ notice that they had to remove all their gear from the ocean by that date. Blue whales and humpback whales are not commonly found off the Humboldt coast, according to local fishermen, and sea turtles do not live in this area. The whales that are commonly seen near the shore are gray whales, which are not threatened or endangered. Our local Dungeness crab in Humboldt. The science on this issue seems to hover between thin and non-existent. No peer-reviewed studies, the gold standard for scientific veracity, were mentioned either by the Department Fish and Wildlife or by the California Ocean Protection Council, which is working with the state to end whale entanglements. In fact, a search of the website for the Ocean Protection Council Science Advisory Team found not a single mention of either whales or crab. The California Dungeness Crab Fishing Gear Working Group, which was tasked with making recommendations for reducing whale entanglements, noted in a 2018 report that better studies were needed. The group later issued a statement dissociating itself from the court agreement. The Journal asked Center for Biological Diversity what scientific data was used in making the decision to close the fishery, and how geographically precise it was. A center spokesperson said he had referred the question to the center’s ligation director, who didn’t respond to the inquiry. Zach Rotwein, a crab fisherman from Trinidad Bay, thanked the supervisors for their support. "Crab fishing is a sustainable certified fishery," he said. "We were blindsided by this ruling. It happened at the very beginning of our crab season. All of us were at sea, taking advantage of the only time of the year we can make a living. It came out of nowhere, the ruling, and all of a sudden we were ordered in. "There's about 500 crab permits in California with an average of three deckhands per boat, so it's actually 1,500 jobs on the ocean and then there's the infrastructure, the buyers and their employees, processors, so we're talking probably about 3,000 or 4,000 jobs that are affected between Crescent City and San Francisco,” Rotwein continued. “But the heart of it all is in Humboldt County and Del Norte. So please consider us. We care for the whales. We're doing everything we can to make entanglements not happen and that wasn't taken into account. We were blindsided. " "I've fished every year since 1976," said Tom Lesher, another commercial fisherman from Trinidad. “With this closure, I can't see how the young guys are going to make it. It's just another nail in the coffin. The (Center for Biological Diversity’s) lawsuit for early closure is based on 2015 data in Monterey Bay, which really has nothing to do with here ... In 40-plus years of fishing, I've never seen an entangled whale." 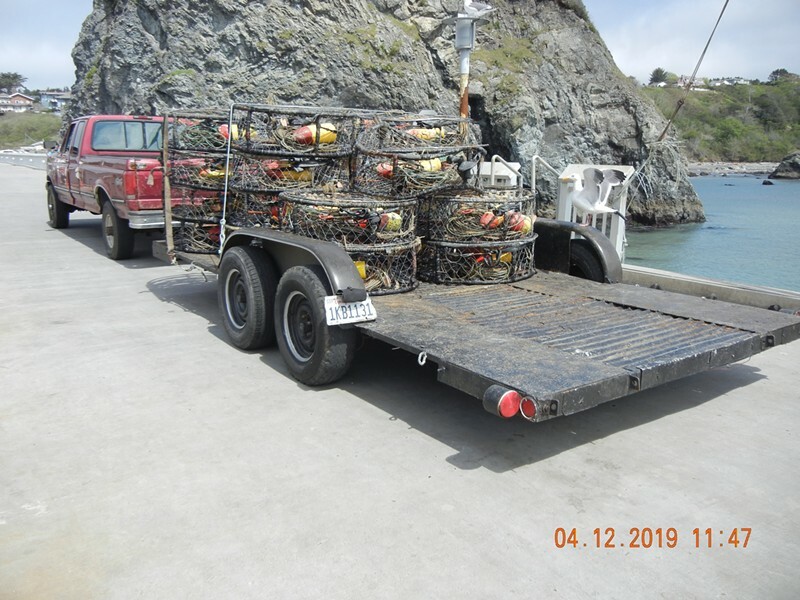 "The Dungeness crab fishery is of the utmost economic importance," said Harrison Ibach, president of the Humboldt Fisherman's Marketing Association. "Not only is it a powerhouse in the fishing industry but many people and families rely on this fishery for their survival. We ask that you now acknowledge that this fishery is now in jeopardy and we are looking for support in any way." Rick Harris, of Pacific Seafoods, said his company has made a $1.2 million investment in its facility over the past year so it could process crab this time of year into July. "So basically, we're out and all those people that were supporting, that have those jobs that we support are out of work,” he said. Two young men said that once they lost their jobs in the fishing fleet, they would no longer be able to support their families in Humboldt and would have to leave the area. Danny Cox from Trinidad said, "I've been a fisherman all my life. In 40 years, I've seen only two whales entangled and we got them both untangled ... This affects hundreds of people. They slammed the door on us." Another fisherman commented, "It's affecting us drastically to take away half of our season. ... What was done to us was very wrong. This is nonsense, that we have so few entanglements in our area and for us to hear that our season is being closed in two weeks doesn't even seem legal." The board of supervisors unanimously passed the resolution of support for the fishermen. At the Trinidad City Council meeting the following evening, many of the same people were present, expressing the same concerns. "In the dead of night, behind closed doors, with a snap of the fingers, the livelihood of the fishing community has been lost," said Susan Rotwein, co-owner of a fishing vessel and Cap'n Zach's Crab House, and former mayor of Trinidad. "We were not represented. We had no say. Our state and federal local officials let us down. They did not protect our sustainable fishery. Fishermen on the North Coast are the victims. In Trinidad alone, we're going to lose at least 60 jobs. From Fort Bragg to Crescent City, the number of jobs lost is in the thousands. The trickle-down effect in our community will be evident at grocery stores, gas stations, restaurants, sales tax revenue, to say nothing of the devastation to the local fishing families." Dennis Mayo, representing the California Beach Fishermen's Association, blamed local California legislators for breaking faith with the fishermen, who he said had been trying their best to work with the state. "We had a Whale Working Group," Mayo said. "For two and a half years we've been working on this in good faith." The Trinidad City Council agreed that the situation was bad and unanimously passed the same resolution of support. The Journal reached out to North Coast state Sen. Mike McGuire, who is the head of the Joint Committee on Fisheries and Aquaculture, but messages left with both his local and Sacramento offices were not returned by press time. McGuire did not mention the fishing problems during his town hall visit to Eureka in February. 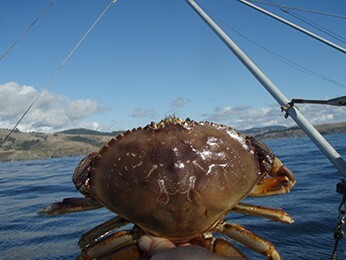 Marine biologist David Hankin, former director of the Marine Lab, told the Journal that April is the best time of year for northern California crab fishermen because it is the mating season for the crabs, and both males and females are found in shallow waters. He added that he had not heard anything about whales getting entangled in local crab gear or lines. "Unless there is substantial evidence of spring entanglement of whales in northern California (Fort Bragg north), it would probably be fine to have the fishery continue to be open," he said. Only one person, who asked not to have his name used, said that he had observed loose crab gear on beaches and in the bay. However, Trinidad Bay Harbormaster Grant Roden explained that stormy weather sometimes wrenches gear loose from the fishing boats. He added that crabbers take great pains not to lose their gear because it is expensive. Susan Rotwein later told the Journal that she estimated a loss of $3.5 million to Trinidad alone — $1.8 million from lost jobs and $1.7 million from lost product. "Crab fishing is 100 percent of the commercial fishery in Trinidad," she said. "All the fishing community wants is the opportunity to fish," she said. "We want this to never happen again. We want our season restored and we want our legislators to do their job."